Although Italy were runners-up to Spain in Euro 2012 this year, clubs have struggled in Europe in the last two seasons as top talent has drained away from a Serie A riddled by scandals, dilapidated stadiums and a lack of investment. "We have to ask ourselves what Italian football will be like in a few years' time," Agnelli told the club's shareholders at a meeting in Turin. "Many nations have experienced a decline but none have had such a sudden collapse. We are seeing a complete structural collapse and it can't just be explained away as being part of the financial crisis. "Football is evolving and it won't wait for Italy. That is a fatal presumption." 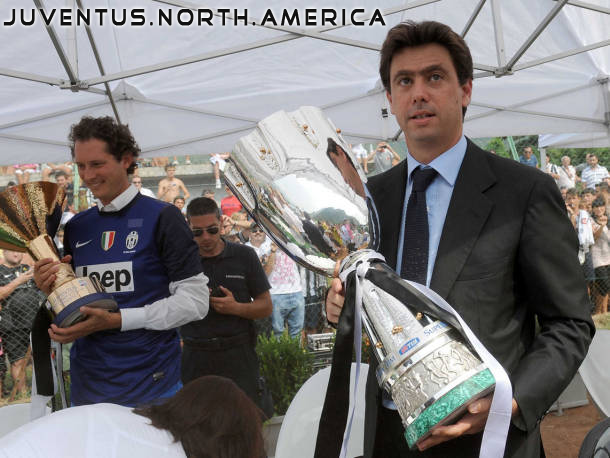 Agnelli was speaking after an especially poor week in European club competition for the six Italian teams involved. In the Champions League, beleaguered AC Milan lost 1-0 at Malaga while Juventus needed a late goal to force a 1-1 draw with Danish newcomers Nordsjaelland in Copenhagen. Of the four teams in the Europa League, only Inter Milan won but they needed a late goal to beat Partizan Belgrade 1-0. Lazio drew 1-1 at Panathinaikos while Udinese lost 3-1 at Young Boys and Napoli were beaten by the same score at Dnipro Dnipropetrovsk with both defeated sides drawing media criticism for fielding weakened teams. Italy lost its fourth Champions League place to Germany this season and Udinese, third in Serie A last term, failed to get through qualifying only two years after Inter lifted the trophy. "Club presidents, the media and general observers ask us if we support this or that candidate to lead Serie A or the Football Federation (FIGC)," Agnelli continued. "Unfortunately, no one asks what needs to be done to fulfil these two important roles. "Who does Juve support? We support a structural reform of professional football ... those who don't condemn Italy to being marginalised in Europe and the world. "Reform of the league, the number of professional clubs and the youth sector. Reform of the status of professional sports, currently governed by a law from 1981 - trademark protection, stadium regulations. "Comprehensive reform of sporting justice, which cannot deal with investments worth millions of euros as though they were a dispute in a local sports club." Agnelli, who has been outspoken about the ban handed to Juve manager Antonio Conte for failing to report match-fixing, also spoke out in favor of clubs balancing their books, saying that Italian football was in danger of being left behind. Giving his backing to UEFA's Financial Fair Play program which demands that clubs live within their means, he said: "Our first objective was to change the club and the team. "In two years we have forged ahead but winning the title means we must not forget our mandate, which is to win while maintaining a balanced financial position in order to give ourselves prospects for the future. "Juventus have always promoted the principle of change in the world of football. There is a need for change in Italian football to put it at the level of the rest of Europe." Juventus, who won the Serie A title last season without losing a match having recovered from a 2006 match-fixing demotion, are unbeaten in their last 47 league matches dating back to the final game of the 2010-11 season. They will be looking to stretch the run at seventh-placed Catania on Sunday. Milan hold the record for an unbeaten Serie A streak at 58 matches from 1991-93.